Jeff Weintraub: Some partial, preliminary, & unfashionable thoughts toward re-assessing the 2003 Iraq war – Did anything go right, and what were the alternatives? Some partial, preliminary, & unfashionable thoughts toward re-assessing the 2003 Iraq war – Did anything go right, and what were the alternatives? There are clearly some good grounds for holding those views (as well as a lot of bad, dishonest, intellectually lazy, and morally evasive ones); and for anyone who supported the war, like me, the past decade has often been a morally harrowing time (or should have been, at least). But I remain convinced that the question was more complicated than that in 2002-2003 and remains more complicated today. I have been struck, in particular, that the vast bulk of recent discussions expressing the "anti-war" groupthink, which is rarely challenged, are marked by two massive omissions. => First, while they properly emphasize the terrible results of the war and its aftermath for Iraqis, for Americans, and for others, they almost never consider the actual and probable costs—human, economic, geopolitical, etc.—of the alternatives to war that were realistically available in 2002-2003. In fact, now as in 2002-2003, almost none of the people expressing the "anti-war" consensus even try to outline or propose, let alone defend, any serious alternative policies that they think could and should have been followed to deal with the very special problems posed by Saddam Hussein's Iraq a decade after the 1991 Gulf War. I've raised those issues in the past from time to time (e.g., here & here), and they still strike me as valid. For the moment, I will just reiterate some of the relevant points from a post I wrote in 2005. [...] I did not support the war because I expected rosy outcomes. Instead, I became (and remain) convinced that the war was necessary and justified primarily because I became (and remain) convinced that, by the end of the 1990s, all the realistically (as opposed to wishfully) available alternative options led almost certainly to politically catastrophic and morally appalling consequences. Thus, for these and other reasons, simply doing nothing and assuming that the status quo would automatically continue indefinitely was not a realistically viable option. Inaction would also have been a choice with serious and unpleasant consequences. [B]y the middle of 2002, there were really only two realistically available outcomes—military action to overthrow Saddam Hussein & his regime, or a victory for Saddam Hussein & his foreign backers. The latter would have been a prelude to the final disintegration of the sanctions-&-containment system, a disintegration which in practical terms would have been irreversible. In realistic terms (and I mean realistic, not "realist"), those were the genuine options—in my possibly fallible but firm opinion—and any serious discussion of the issues surrounding the 2003 Iraq war has to begin by facing up to this reality. Most of the discussion of Saddam Hussein's missing "weapons of mass destruction" have had a certain irrelevance and unreality from the start. The size of his existing stockpiles was never the key question. Most informed analysts (including all the major intelligence services), however much they disagreed on details, generally agreed that Saddam Hussein had active nuclear, biological, & chemical weapons programs. (It was German intelligence, not the CIA, that said in 2001 that Saddam was probably about 3 years away from getting nuclear weapons.) It turned out they were all wrong, and the whole thing was a fantastically successful bluff on Saddam's part—though the only reason we know this is precisely that the Iraqi Ba'ath regime was overthrown—but, fundamentally, so what? This was just a matter of timing. Once containment had collapsed and Saddam Hussein was out of the box, he would have been ready and eager to resume his NBC weapons programs. (Scott Ritter, for example, explained this all quite cogently in 1998, before he experienced his strange conversion over Iraq.) It would no doubt have taken Saddam Hussein a while to get a nuclear weapon, and perhaps some stroke of luck in the meantime might have prevented this, but otherwise it was just a matter of time. In the medium term, given everything we know about the nature and history of the Iraqi Ba'ath regime and Saddam Hussein's own history and inclinations, one could expect renewed military adventurism, another of his catastrophic miscalculations, and a bigger and more destructive war down the line. And so on. I don't want to leave the impression that these are the only likely and predictable catastrophic consequences that would have followed the imminent collapse of the sanctions-&-containment system, but it would take a while to lay them all out in detail, and those will do to suggest the key background considerations. I waited all through the debates of 2002-2003 for opponents of the war to offer any half-way honest and plausible alternative to military action that took these realities seriously, and that offered a plausible likelihood of preventing the consequences I've just outlined. I never heard anyone offer any such proposal that struck me as even remotely realistic or convincing—which is part of the reason I decided that, on balance, the war was necessary and justified. Political judgment requires making choices between a range of realistically available options, based in large part on an assessment of the likely consequences of different courses of action. Your piece argues, in effect, that many of the negative consequences of the decision to take military action against Saddam Hussein & his regime in 2003 were readily predictable and, in fact, highly likely. OK, let's say, for the sake of argument, that you're right. That's not enough. The relevant comparison has to be with the likely consequences of other possible courses of action available at the time (including inaction). So, to reiterate, what do you think would have been a superior alternative back in 2002-2003? Can you identify and defend a realistically available, morally acceptable, politically workable alternative course of action whose likely and predictable consequences would have been less disastrous than the ones we've actually seen so far? This is not a rhetorical question, by the way. If you or anyone else could (hypothetically) present such an alternative scenario that I found at all plausible & convincing, then I might be forced to reconsider whether my support for the war (trepidations and all) was actually intelligent or justifiable. In the absence of such an account, then it seems to me—rightly or wrongly—that your discussion fundamentally begs the question. => Second, people who take it for granted that the war and its consequences were an unmitigated disaster for Iraqis tend to focus exclusively on Arab Iraq. They almost uniformly ignore Iraqi Kurdistan. It's understandable why they would do that, and the Arab part of Iraq does account for about three-quarters of Iraqis ... but any assessment of the 2003 Iraq war and its consequences that ignores Iraqi Kurds is obviously incomplete, misleading, and less than fully honest. It's not just that the actual outcomes in Iraqi Kurdistan have been (on balance, and under the circumstances) remarkably good ... but also that the probable consequences of the realistically available alternatives to the 2003 Iraq war (which would almost certainly have included the final disintegration of the whole sanctions-&-containment system, which had been unraveling at a rapidly accelerating rate, followed pretty soon by another genocidal bloodbath in Iraqi Kurdistan, as I noted earlier) would have been especially awful for Iraq's Kurdish population. Instead, Iraqi Kurdistan is now autonomous, secure, and thriving. And depending on the contingencies of regional geopolitics, there are good prospects for that situation to continue. 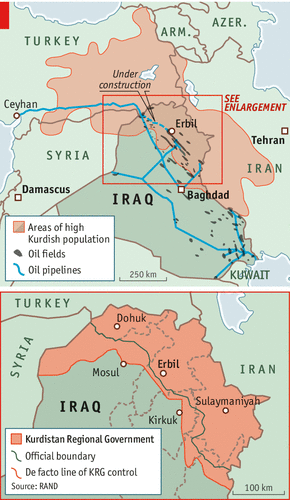 Iraqi Kurdistan tends to get a lot less attention from the news media than Arab Iraq, but an article in the current issue of the Economist sums up some of the good news. 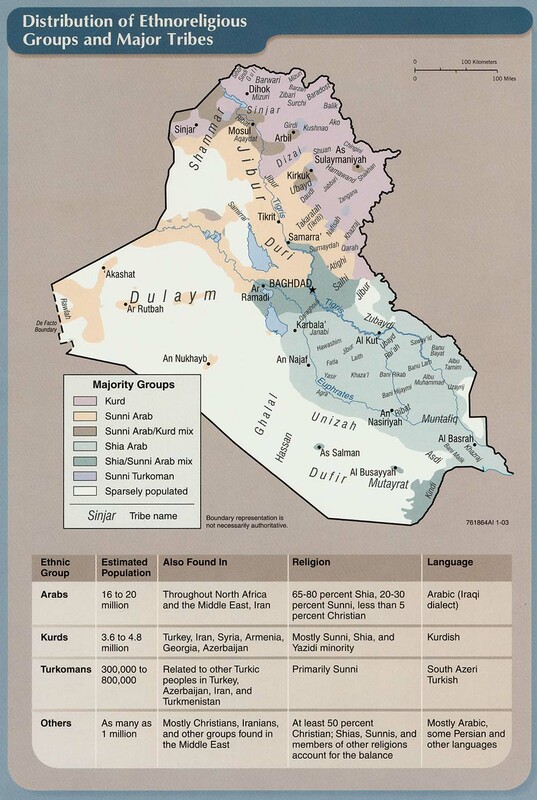 The relative order, security and wealth enjoyed by the 5m residents of Iraq’s three Kurdish provinces [JW: see the maps at the end of this post] are the envy of the remaining 25m who live in the battered bulk of Iraq, and of others too. Since 2011 some 130,000 Syrian refugees, nearly all of them ethnic Kurds, have been welcomed in as brothers; the UN says that number could reach 350,000 by the year’s end. From the east come Iranian Kurds eager to work on the building sites that bristle across a territory the size of Switzerland. [....] Iraq is now Turkey’s second export market after Germany, with 70% of that trade directed to the Kurdish part; 4,000 trucks cross the border daily. It was not always like this. Surveying a dusty vista of tents at Domiz, a camp housing more than 50,000 destitute Syrians outside the booming city of Dohuk, an Iraqi Kurd shrugs and says, “Twenty years ago this was us.” He is referring to the aftermath of the Anfal, a campaign in the late 1980s by Iraq’s then-leader Saddam Hussein to crush a Kurdish uprising. It left at least 100,000 dead, destroyed 4,000 villages and created 1m refugees. Another straw in the wind: In March I happened to notice a piece in the Washington Post, written by someone who headed an interdenominational religious delegation visiting Iraqi Kurdistan, which was willing to declare unequivocally that Kurdistan has been "an Iraqi success story". There are actually at least two Iraqs. Because it continues to make headlines, most Americans are familiar only with the southern region and its capital city, Baghdad. The northern region is rarely in the news. By every measure, it is a success story. And—this is significant—not just for the Muslim majority. Iraqi Kurdistan has been an autonomous region since 1991, when the United States and its allies in the first Gulf War declared the “Northern No-Fly Zone.” The Kurdistan Regional Government (KRG) has used that security shield to create one of the few safe harbors for religious freedom and pluralism in the Middle East. Remarkably, this liberty extends beyond simple freedom of worship. The KRG has rebuilt seminaries and churches, supported church-related schools and welcomed Christian refugees from southern Iraq and Syria. Of course, there are a lot of things wrong with Iraqi Kurdistan. By Scandinavian standards it doesn't measure up very well on a lot of social, economic, or political criteria. But by Middle Eastern standards, which are more appropriate, it looks pretty good in terms of both present conditions and plausible prospects. And in assessing the overall consequences of the 2003 Iraq war, those outcomes should also count in the balance.